The geometry of the backscattering spectrometer is such that the equipment from the general sample environment pool are not necessarily compatible with the instrument. We have a dedicated set of equipment that covers most of the conditions required by those who perform experiments on the HFBS. If you are unsure whether your experimental requirements can be met, or if you have special requirements, please contact one of the instrument responsibles. Additional information provided by the NCNR sample environment team can be found by visiting their Website. The sample cans that are generally used on the HFBS are made of aluminum and are sized to be commensurate with the neutron beam dimensions. These cans can be sealed with either indium or lead o-rings, depending on the temperature range desired. A drawing of the cans and one of the inserts is shown below. 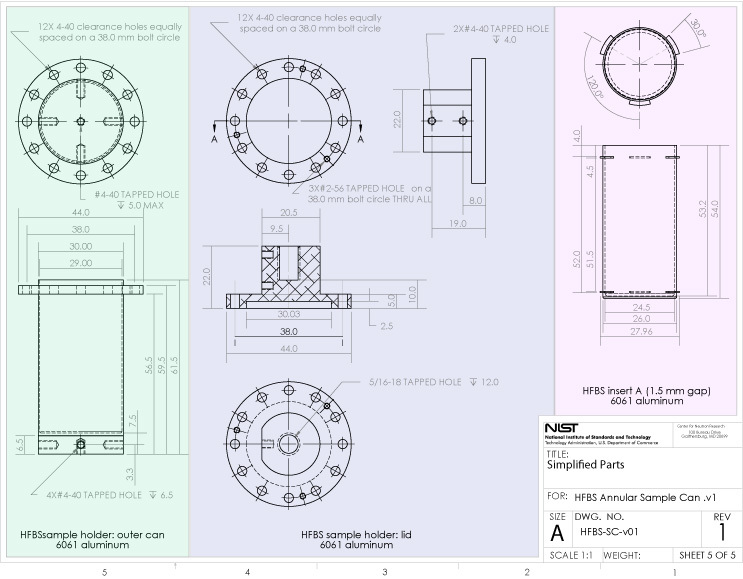 Plans for the HFBS annular sample cans can be downloaded (opens a new window) in pdf format. Experiments that access temperatures in excess of 800 K cannot use aluminum cans. For these measurements, some appropriate can materials are niobium and Titanium. We have a limited number of such cans available, but please be sure to coordinate with one of the instrument responsibles to plan your experiment, as there are some other special requirements involving the furnace. Below are the mounting heights for the different sample environments. The Top-loading Closed Cycle refrigerator is the default sample environment on HFBS since it is the most commonly used. It is a top-loading version of the well known CCR (aka displex- see description below). The sample is placed at the bottom of the stick and then inserted into the sample well. Link to the closed-cycle refrigerators website.